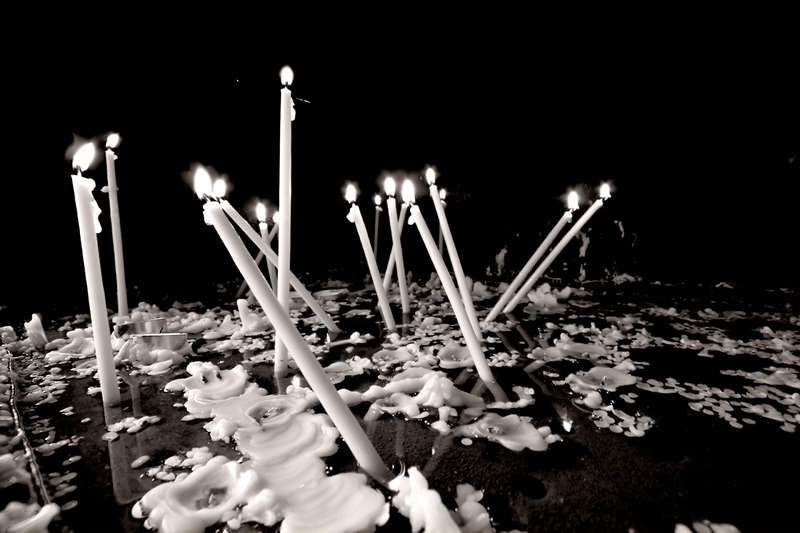 Romanians do keep the tradition of lighting candles separated in ‘for the dead’ and ‘for the living’. This is a way for Monasteries to make some money since they are manufacturing the candles, but mostly a good opportunity for people to act / feel concerned about their closest ones: when you light a candle you say in your head the name of the person(s) whom you light the candles for. In the case of the dead, it’s in their memory. The sharp edges of the light are obtained just from the levels and B&W settings, no selection, no burning, or anything. Ok. Let’s make it clear: you never shoot candles in B&W. Why? We all know that photography is(besides art, besides the art of recording pictures, besides the ability of getting the right exposure, the right composition and the perfect lighting conditions) just a way of sending a message. Shooting this type of candles could suggest a lot of things, like sadness, loneliness, life, DEATH, etc, but i think they all have something common: LIGHT! Candles create light! Candle light should always be warm. This photo makes me feel cold. Looking at a postcard of a candle in a cold day will always give you that feeling of warm you need. No matter you shoot a candle on a grave it should always be warm. But this is my opinion, I’m no professional photographer or artist(yet), but I guess that being a good photographer means being able to share with the others your ideas and your feelings. Like I said, consider this a thought that came from nowhere! I never get upset from constructive criticism, in fact that is why I allow comments and why I show my work, to get feedback :-). Mind you these are not red candles among Easter eggs or winter chocolates, these are candles that people light in the memory of their beloved dead… It’s not a candle supposed to make you warm and cosy but thoughtful. and etc. I know exactly why I shot this photo, and I have described the reasons: I am obsessed with this shot… Each time I try a different composition.